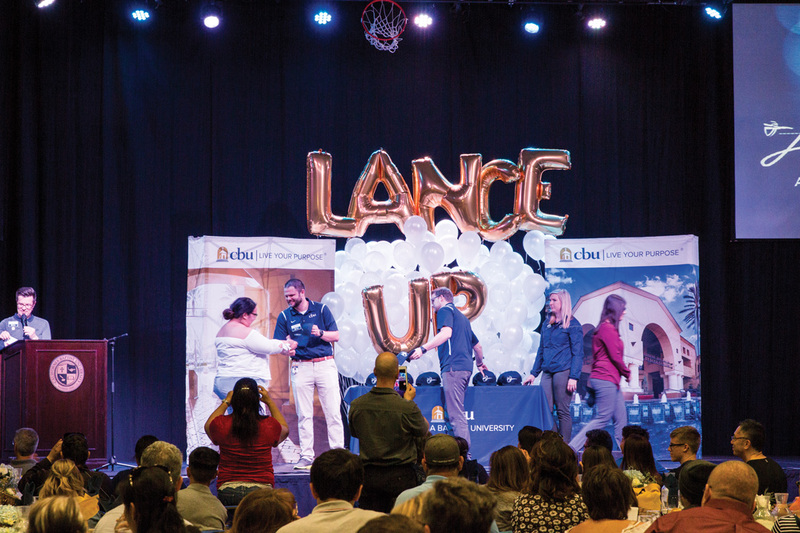 High school students who have been accepted for the fall 2017 semester were welcomed at Lancer Night hosted by California Baptist University’s Office of Undergraduate Admissions, April 4 and 11. Three hundred and fifty students and parents attended the April 4 Lancer Night and 380 attended the April 11 session. Students were able to meet other accepted students and take part in the CBU connect fair and campus and residence tours offered. Taylor Shelberg, visits and events coordinator for the Office of Undergraduate Admissions, said the event is to give students another chance to come on campus after they have been accepted to CBU. Toward the end of the event, students and their parents enjoyed a dinner in the Van Dyne Gym, along with a signing ceremony at the end. The signing ceremony saw the accepted students who are attending CBU next fall have their name announced by Brett Vowell, director of Chapel, walk across the stage, receive a Lancer hat and sign a board. The Office of Undergraduate Admissions partnered with FOCUS, to cheer on the new students at the signing ceremony in the gym. Michael Reid, sophomore business administration major and freshmen FOCUS leader, said through the event the students saw what the CBU atmosphere is all about. When the event was over, students and parents were given the chance to take pictures with “Lance” the Lancer, CBU mascot, and ask any questions the students may have. Danae Erber, 18-year-old high school student from Rim of the World in Lake Arrowhead, will pursue her degree in history next fall and said her favorite part was learning the ropes of CBU and getting excited to enroll in the university next semester.